Find out a bit more about our coffee shop Bath at Lakeside and our Pine Tree Coffee Shop at Fonthill. The Garden Room at Lakeside was opened in 2010 and has quickly become a firm favourite with our customers. 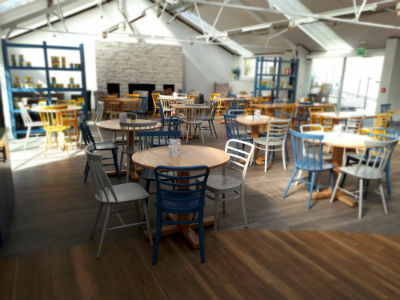 Positioned with a patio offering lake views, it offers a modern contemporary setting where up to 50 people can enjoy a wide range of high-quality refreshments, everything from speciality teas and freshly ground coffee, through to wonderfully tempting home-made cakes. Denise and her team would love to see you so why not stop by on your next visit? The Pine Tree Coffee Shop opened in May 2015. Since then Maria and her team have quickly established a well deserved reputation for producing excellent hot lunches and of course home-made cakes, biscuits and tray bakes. There is seating for up to 60 people inside, as well as a wonderful outside patio area to be enjoyed on sunny days, so why not treat yourself on your next visit?